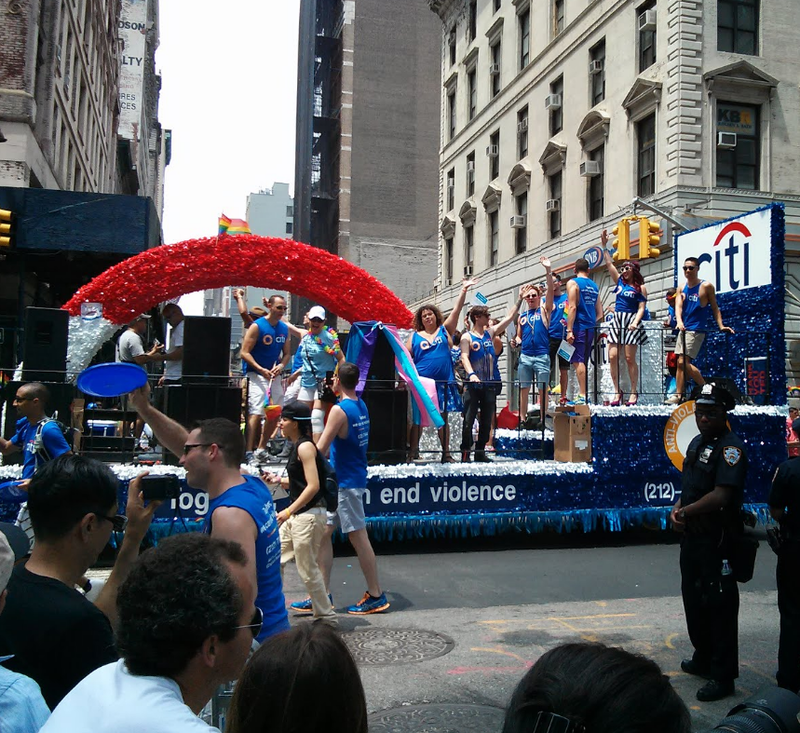 The Citi float at the Pride Parade in New York. About 200 Citi employees marched behind the float, many riding “Citibikes,” one of Citi’s most visible marketing programs in NYC. Last week I was fortunate to be in New York City over the weekend, accompanied by most of my family. I had meetings with senior marketing executives at companies like Coke, Citi, and many others, and they stretched from the previous Weds. all the way into Monday of last week. I hate being away on weekends, and my wife is from New York, so she brought my daughters to visit their grandmother, who lives right in the middle of Manhattan. Now, a weekend in New York with your family is special anytime, but last weekend was particularly notable because of the annual Pride Parade. This celebration of LGBT rights is one of the largest in the world, and this year’s was historic – just the week before, the Supreme Court had voted down the Defense of Marriage Act, a major civil rights victory for the gay community and, by extension, for citizens across the country. Last Sunday, our family joined tens of thousands of others who cheered the parade down Broadway, marveling at the exuberance and yes, sometimes at the show of skin as well. But what stuck out with us was the pure joy of the day. Both my daughters, one fifteen, the other nine, joined in the celebrations, waving flags, cheering, and slapping high fives with passersby. Everyone was so happy, and the party snaked down Broadway for hours. What really struck me was the diversity on parade – gay fireman and policemen (that can’t be an easy world to live in) marched in uniform, followed by politicians like Mayor Michael Bloomberg and Sen. Charles Schumer. There were community centers on floats blasting dance music, and a long assortment of “firsts” – the first gay married couple in New York, the oldest married couple in New York, etc. And then there were the brands. Yes, the brands – sponsoring the parade, and marching as part of it. I was prepared to be disappointed, and even cringed when I saw the first banner announcing a brand – I think it was Vitamin Water, a Coke brand. But instead, I was inspired. I had just met with many of the brands that were represented, and it made me proud to know the folks who had the courage to stand out and stand up for what was right. As I watched the parade I was struck at how deeply and how honestly these brands were part of the celebration. Sure, Vitamin Water gave out free drinks, but the real story were the legions of employees – from Citi, L’Oreal, Wells Fargo, Coke, Delta and many more who marched, proudly wearing their company’s logo, proud of their individuality, proud of their voice, and proud that their businesses have stood behind them on their journey to this historic day. It felt very real – these companies clearly had backed their people on the long road to full civil rights, and their employees were proud to celebrate their brand connection – they very much believed that in their lives, the brand on their t-shirt had made an important difference. It was a very honest moment, and that’s not always the case when it comes to sponsorships and marketing. It should inspire all of us in the media business to follow the path of true human connection in our work. It certainly inspired me. I can’t speak to issues regarding all the enterprises mentioned… and some of them may be wonderful and ethical businesses. But I’d omit those you mention claiming to be involved in financial services (Citi and Wells Fargo). Hosting a float and sending out a few employees isn’t going to do it. This is a strong statement which I’m not happy to feel it necessary to make. But its a fact and not seriously being addressed. P.S. A viable speech-related micro-transaction is only part of the necessary palliatives. Patent issued. Represented by Perkins Coie in Los Angeles (on their dime). Its been ready since 2008. My own specifics on Wells Fargo and improper foreclosure will have to be a fascinating (and well documented) story that waits for another day. I’m sure its only one of many. Previous Previous post: Halfway Into 2013, How’re The Predictions Doing?